As the Project Administrator for the Texas State Genealogical Society Project (TXStateGS) at Family Tree DNA one of my responsibilities is to notify members and prospective members of upcoming and ongoing sales. If you've been waiting for a good sale before ordering a DNA test, the time is now. Family Tree DNA has great tools to help analyze your DNA data. They provide full access to all of your DNA data; after all, it is YOUR DNA. They have great Frequently Asked Questions (FAQ) lists to provide all the information most of us need. If you can't find your answer in the FAQ there are helpful customer service reps available through telephone support. Best of all, the company founders are genealogists who understand us and our needs. Click here to order a new kit and join the Texas State Genealogical Society Project at the same time. If you are already a Family Tree DNA customer, login using your kit number and password to order an upgrade. New customers can also order a test without joining a project, but you may miss some special project discounts and assistance offered by project administrators. Be sure to order and pay for the upgrade before the end of the year to get these special prices. Debbie Parker Wayne, "Family Tree DNA 2012 Holiday Sale," Deb's Delvings Blog, posted 13 November 2012 (http://debsdelvings.blogspot.com/ : accessed [date]). I am constantly reminded about what a small world we live in and how we can all be related in more recent times as well as once we go back thousands of years. This is another example of why it is so important to trace the FAN club (Friends, Associates, Neighbors) even when it hasn't been a line of primary interest before DNA testing came along. I also suspect having access to the raw DNA data will be critical as I work on this problem. A few months ago I wrote about a two-fer with a new DNA match at Family Tree DNA. I recently found out I have a three-fer with this same family. We haven't yet identified the third line my family members share with this other family, but there obviously is one on the "step" side of the family. I hope the diagram makes these relationships more clear. In this case female #1 represented by the green circle (F#1 J) and female #2 represented by the orange circle (F #2 N) both had multiple partners represented by the squares. 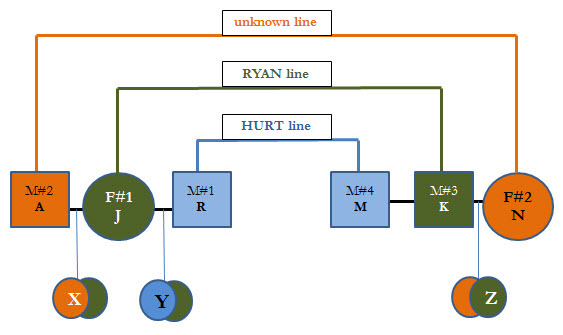 In the earlier post I discussed how Y, K, and Z match on the Ryan line. Y's Ryan line is through the mother J. Z's Ryan line is through the father K.
Y's Hurt line is through the father R. M, who is the second husband of N, has a Hurt line. So Y has matches to both partners of N and the child of N. None of these people knew each other before they matched on the Family Finder DNA test. We found this link back in August. X is the half-sister to Y—same mother, different father. X also shares the Ryan line through her mother J and should match Z whose Ryan line is through her father K.
But now that X's results are back we also find she is related to N. This link is likely through X's father A. Knowing about the ancestry of N may provide information about the paternal ancestry of X even though we know very little about her paternal line at this time. Three groups of children related in different ways to two women and the four men those women have partnered with during the last sixty years. Wow! Is this cool or what? I suspect our blended families will result in more and more multiple links between families as we explore what we can learn from DNA testing. And none of us knew or suspected each other before DNA matched us up. Debbie Parker Wayne, "DNA Two-fer Becomes a Three-fer," Deb's Delvings Blog, posted 8 November 2012 (http://debsdelvings.blogspot.com/ : accessed [DATE]).